Greetings from Santiago, Chile on Day 4 of the 13th Pan American Maccabi Games! Today marks the halfway point of this amazing Maccabi experience for our athletes, coaches, staff, and supporters. All of us who were here in Santiago 12 years ago for the 10th Pan American games had high hopes for another great set of games and our high expectation have been met and exceeded. The city of Santiago has been an amazing backdrop and the Chilean organizers have done a remarkable job of managing the thousands of logistical details needed to put on a successful event of this magnitude. From the magic and emotion of the Opening Ceremony to the energy and vibrancy displayed every day at the Estadio Israelita Maccabi (EIM), Team USA has been treated to an incredible four days of sport, culture, and most importantly, Jewish Pride. At all of the venues where our athletes are competing, Team USA is off to a great start. Several medals have already been awarded in Gymnastics, Swimming, Judo, Golf, and Chess and many of our other sports are preparing to enter into the medal rounds of competition. 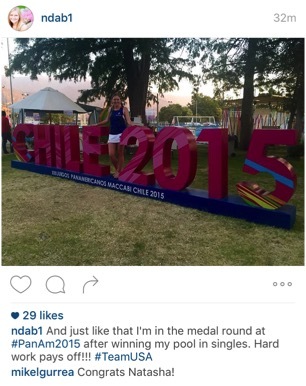 Our athletes and coaches are representing the United States with class and the highest level of sporting conduct. 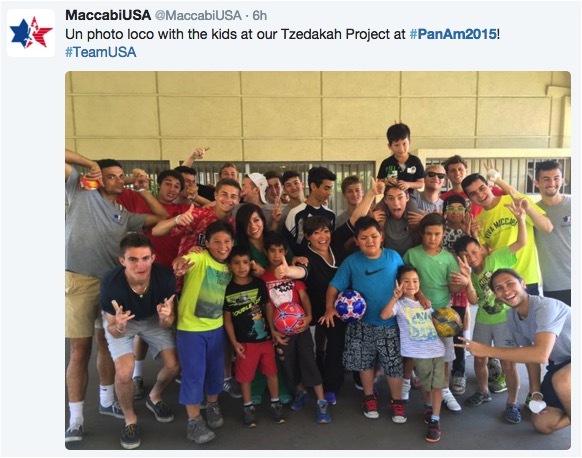 At the same time, they’re enjoying the opportunity to interact with Jewish athletes from around the world in a way that can only be found at a Maccabi event. All of us are looking forward to a major New Years Eve celebration tonight at the EIM, more competition tomorrow, followed by a games-wide Kabbalat Shabbat tomorrow night and a welcome day of rest on Saturday. On a more personal level, I couldn’t be more thankful for the opportunity to help lead this incredible delegation of proud Jewish athletes, staff and supporters. Thanks to all of you, both here in Santiago and those cheering us on from abroad, for all that you’re doing to make this such powerful experience for Team USA. Today's competitions: Basketball, Beach Volleyball, Chess, Futsal, Golf, Soccer, Swimming, Table Tennis, Tennis & Volleyball.